Acupuncture can be used alone or combined with conventional Western Medicine, Osteopathy and Cranial Osteopathy, Herbal treatments and Homeopathy. The World Health Organization recognizes Acupuncture and Traditional Chinese Medicine as a viable means of treatment for a wide range of conditions. Genitourinary/ Gynaecology: Infertility, Impotence, Premenstrual Syndrome, Menstrual Problems, Menopause, Cystitis. Acupuncture focuses on improving the well being of the patient as a whole and as such it can help people with a wide range of ailments. The Acupuncture Research Resource Centre (ARRC) who are based in London have a number of briefing papers which cover research on acupuncture’s effectiveness for a variety of conditions. The National Center for Complementary and Alternative Medicine (NCCAM) who are US based have also compiled a list of research documents. Since each person is unique the number of treatments needed, will vary. In general, chronic long term conditions take longer to treat than acute conditions that have just occurred. If the patient is in good health recovery is usually quicker. Also the frequency of treatment prescribed will have an impact. Initially treatments may be administered close together and then become less frequent as the condition improves. We will discuss the treatment options in your consultation. In short, there is no widely accepted theory as to how acupuncture works. The traditional Chinese theory holds that the body’s life energy called Qi (pronounced Chee) travels around the body in pathways called meridians. The acupuncturist views illness as an energetic imbalance and is able to influence this imbalance by inserting very fine needles at certain points along these channels called Acupoints. The acupuncturist may also use heat treatment (called Moxibustion) in the treatment. We use far-infrared heat lamps in the clinic in place of herbal moxa. Much research show that acupuncture causes a release of endorphins, the body’s naturally produced painkillers. Research also indicates that acupuncture causes beneficial effects to the body’s immune and endocrine systems. A good deal of research has been carried out on the ‘Pain Gate Theory’ first proposed in 1965 which basically held that the insertion of an acupuncture needle can interrupt the signals from the sensory nerve endings to the brain and thus have an analgesic effect. However most modern research is focussing on the theory that acupuncture has profound neurophysiological effects and up to details of current research can be found on the US National Institutes of Health website (www.nih.gov). “Energy Medicine: the scientific basis” is a good introductory work and an easy read. “Energy Medicine in Therapeutics and Human Performance” is a more detailed book and covers a broader area of research. Most people’s experience of needles is that of those used to give injections, take blood etc. Acupuncture needles differ from these hypodermic syringes in that they are much finer and are solid rather than hollow, they are designed to part the skin without cutting the tissues. Sterile stainless steel needles are commonly used with a diameter of between 0.14mm to 0.35mm which is about the thickness of a human hair. You may experience a slight prick as the needle penetrates the skin but this is a momentary experience, most people would describe the feeling as virtually painless or no more painful than plucking out a hair. What happens after the needle is inserted is of much more importance and you must provide feedback on what you are feeling to your practitioner. Most people feel a dull ache, tingling or feeling of heaviness or numbness around the area where the needle is, occasionally a mild electrical pulsation radiating away from the site of the needle is felt. Reactions such as these to needling are of vital clinical importance to the Acupuncturist and signify that the Qi has been accessed, i.e. De Chi (pronounced De Chee). The needles are then left in place from 15 to 30 minutes and may be occasionally manipulated by the Practitioner. Removal of the needles causes no discomfort and minor bleeding may sometimes occur which can be stemmed with a cotton swab. The practitioner may also insert needles into the surface of your ear (Auricular Acupuncture) depending on your condition. Some facial acupoints may bruise after needling so if a minor facial bruise bothers you then tell your practitioner and usually another acupoint can be selected elsewhere on your body. It is vital that you tell your practitioner if you suffer from any diseases transmissible by blood (e.g. HIV, AIDS, Hepatitis etc.) or if you are on any blood thinning medication, these facts should come out during the Case History but you must disclose this to your practitioner. It is also vital that you tell your practitioner if you are (or even suspect that you might be) pregnant as some acupoints are contraindicated during pregnancy and neither you nor your practitioner will want to take any unnecessary risks with your pregnancy. 6 months after my Anterior Cruciate Ligament reconstruction I’ve begun rehabilitating for my sports, Taekwondo and Aikido. 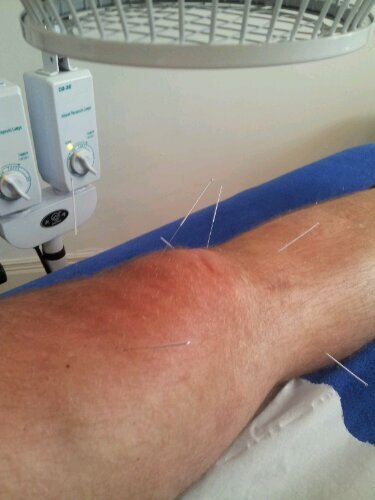 Bit of swelling around knee cap though no pain. A few needles and far infra red lamp and I’ll be fine in a few hours!